Last Friday, I brewed a Black Saison. Why? Mostly because I can. I've never brewed a saison before. You might argue that I still have not brewed one just based on the color. The BJCP Style Guidelines say that a saison is "pale orange but may be golden or amber in color" (5-14 SRM). Mine is really dark brown to black, around 24 SRM if Beer Smith calculated my color correctly. It certainly does not look like a typical saison. But, I am hoping it will finish out dry with the spicy, farmhouse character you would expect in a saison with lots of Saaz hop character. I expect despite its color it will smell and taste like a saison. I guess we will see. I am calling the beer Arctic Vortex Winter Saison, and you can view the recipe by following this link. Wow. It has only been really long time since I've done a report on my untappd badges. Mostly, I was waiting to get to 500 unique beers, which is quite a milestone. Plus, I have not been earning them all that fast since Thanksgiving or so. I got an email from a guy at Biking - Answers.com. He was nice enough to point out a couple of broken links I had on Bike to Work Week. Not only did he point out the broken links, but he told me how to fix them. As lazy as I am ... I probably would have just removed the link has he not shared where the new links should go. Actually, not only did he email me once, but I forgot about it, and he nicely reminded me. I think I got everything fixed on my article. He also asked me to check out Biking - Answers.com, which I did briefly. I think it is an awesome site for those of us who like to bike. Made me wish for snow-free roads so I can start biking more. 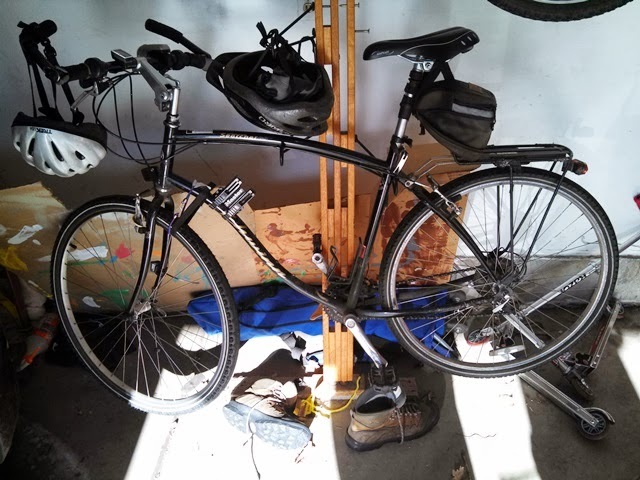 My bike is just hanging around. Need to get back on it. A couple of weeks ago I noticed that the blog on Women Enjoying Beer, in their article Why Gender In Marketing Beer Matters linked to one of my blog posts. The author linked to Still More Sexist Beer Labels as an example of highly sexualized images on beer bottles (yes, Virginia – there’s a massive problem). Not surprisedly, she (I assume the author is Ginger Johnson, but the article doesn't specifically say) is not a fan of highly sexualized images used to market beer. I don't blame her. Do you remember Gnasty the Gnome? Just as a very quick reminder, last year my loving wife and kids (aka the SheppyBrew Beer Model and Brewing Assistants) bought me a Chicago Blackhawks Gnome to help me get over my irrational fear of gnomes. Of course, Gnasty the Gnome being a Blackhawks fan gives us something in common, and although I still have a lingering distrust of the creature (probably more my fault than his) we have become friends. Coincidentally, he also loves the same beers that I do and we collaborated last year to create a recipe for the BJCP Category 8 English Pale Ale (see SheppyBrew Styles). The recipe we created and brewed was Gnasty the Gnome ESB. 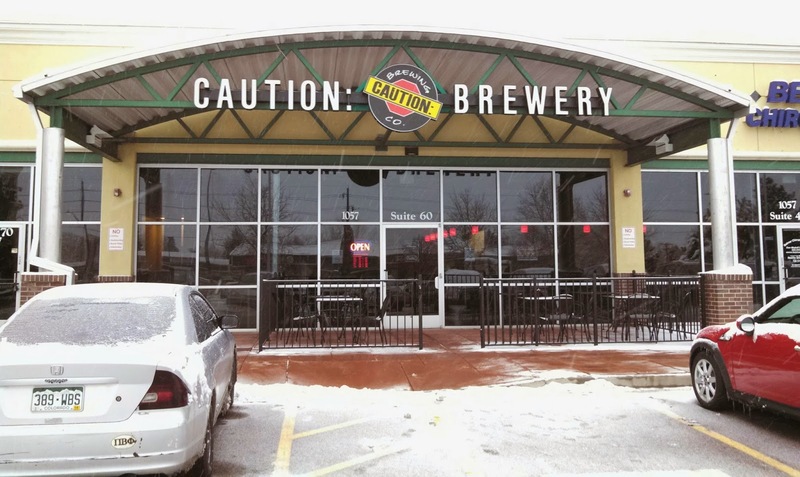 Recently, Caution Brewing Company opened a second location, that just happens to be very close to my home brewery. Shamefully, I've never been to their original location, and until last weekend, had not made it to the new one either. Last Saturday, though I needed to get my wife a growler so she'd have something to drink watching the SuperBowl. I used this as an excuse to stop by Caution Brewery West.